Sky Digital offers hundreds of TV channels and is building monthly with its popularity, as more people are using Sky Digital as their entertainment presence. Dozens of channels dedicated to movies, entertainment, documentaries, sport and arts – as well as loads of kids channels- mean you’ll always find something interesting to watch. Did you know that you do not need to turn to Sky for your digital TV installation. A4 Digital Aerials have a long experience in Digital technologies for installation and support and we can often come out to you on the same day. Our experience means that we can offer you the best advise you on all your satellite dish and set-top box requirements. We can install your Sky Digital service for you and help you organise your TV channels package. We can show you and your family how to get the most out of your new TV service, and we will back this up with our guaranteed service, labour guarantee and lifetime telephone support. 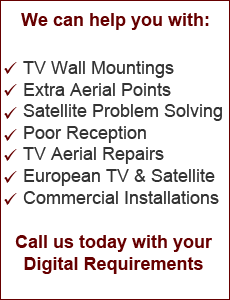 Our service is what makes us the number one choice for Sky Digital installation. To find out more about Sky Digital and to book your installation, please use our contact form, or if you prefer, call us on Freefone 0800 6122 0151. With extensive experience in helping both the construction industry as well as many government agencies, we’ve installed aerials, Satellites and even CCTV for schools, building sites and even apartment buildings. When you need top quality coverage and you need it now, there really is only one choice, and that’s A4 Digital.